n crusting, desquamation, ulceration, atrophy, and inflammation of the lips, especially the lower lip, caused by chronic exposure to the elements and actinic rays of sunlight. 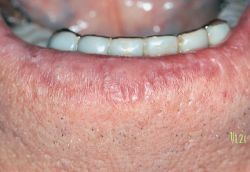 n focal areas of inflammation of the lips caused by cigarette paper sticking to the surface and injury produced by efforts to remove it. n chronic diffuse nodular enlargement of the lower lip associated with purulent inflammatory hyperplasia of the mucous glands and ducts. Rare; unknown etiology.